That's right! 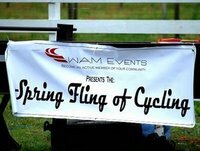 WAM Events and our friends at Winter Park Cycles are partnering to host a series with its own points designation and overall payout. The WAM Events 2013 Clean Racing Series p/b winterParkCycles.com begins in Deland and finished later this Spring in Deland. The top 80% of a rider's results will be used for the overall payout. Races included are: Spring Fling, Lake Mary Race Weekend, VeloFest, Daytona Beach and Deland Speed Week. Each race will donate a portion of the entry fees to the Florida Clean Ride fund supporting Fair racing in Florida. Note: In the event of a tie in points, the rider with the most wins in the WPC series races will be awarded the higher placing. In the event the riders are still tied, the rider with the most 2nd place finishes will be awarded the higher placing. This will continue until the tie is broken.